I spend a lot of time contemplating health. What it means to be healthy. How one becomes healthy. How to help improve the health of my clients. Comparing and contrasting modern versus ancient approaches to health. It’s passion meets obsession but in a beautiful, enjoyable way. Two days ago I went to the Tirta Empul Temple in Bali. The temple was built in 926AD to honor the Hindu god of water, Vishnu. The name – Tirta Empul, means ‘Holy water spring’ in Balinese, and this is where local Balinese Hindus have come for over a millennia to cleanse their minds, bodies and souls, in the curative waters of the pools. At the temple, I got the run down of how to set me intention/prayer, give my offering and then how to perform the water ceremony. As I listened to the temple keeper’s explanation, i was reminded of the spiritual gifts of illness, pain and suffering. He shared with me that in Bali, they are grateful for their pain because their pain gives them strength and forces them to grow. A stark contrast to American culture where we are taught to avoid pain at all cost. This morning I was laying here contemplating this. So many of my clients are struggling with pain and suffering. I am watching my mother deal with Lupus symptoms (she’s currently visiting). I have my own imbalances that I am constantly keeping in check. What if this was all a gift? Well, in my deepest heart of hearts I know this to be true. I know that dis-ease is at the core of our spiritual evolution. A read an article by a famous 5 Elements practitioner named Thea Elijah a few years ago explaining the concept of resonance medicine in Chinese medicine and acupuncture and how historically it was used to prepare one for death. Not that it would kill you but rather it would increase spiritual awareness so that when you die you would be at a higher level of consciousness. And I guess that was and is the goal. No one is escaping this existence alive. Then I think about the yogic sciences concept of fate versus destiny. Fate being the life that we live by default. Destiny, the conscious life we create by design allowing us to tap into our deepest source power and bringing abundance into our lives. If we are living our default life and on automatic mode, I imagine that this is the place where suffering takes place. We are victims in this reality. Everything is happening to us. We are in resistance. But what if we chose to bring consciousness to our pain and suffering and relate to it as a gift? Wouldn’t this transform everything? Our food sensitivities wouldn’t be a burden but rather a gift from our body telling us what is damaging us and what needs to change. Our pain would be signals that we need reevaluate our life choices. Our fatigue would tell us to slow down. Instead of bulldozing these symptoms and wishing them away, we would respectfully and lovingly listen and then make our choices from this gentle accepting space. Wouldn’t that in and of itself be healing? Wouldn’t that be a more evolved state of consciousness? Compared to the fear and resistance that most of us struggle with when discomfort ensues. The more that I dive into the rabbit hole of health, the more that I am certain that the journey to health is so much more than just diet, herbal protocols, and detoxes. Do I think that those are helpful and necessary? Absolutely. Nourishing your body, having healthy boundaries and reducing toxic loads are definitely a must and a spiritual practice. But I am feeling more and more certain with each passing day that the key to transformation and health is really in how we relate to everything. Can we trust, accept, be grateful and transmute? Or will we be in fear, contracted, rigid and resist? Which one do you think is the quickest way to health? Do you need meat medicine? Could eating meat be a spiritual act? I was standing in a woman's womb activation circle at Bali Spirit Festival when women started sharing their visions and dreams to be manifested and collectively held by the group. Women were shouting out things like “supportive partner!” and “teaching our kids about love and peace!”, when one woman called out “a vegan world!” and all the women moaned in alignment….all except for maybe me. I want to begin by saying that I am in no way opposed to veganism. At least not from the sense of morality and environmentalism. I am however opposed to any rigid diet that has no end or clear intention and is potentially is creating self harm….even if it is in the name of doing no harm. Let’s travel back in time for a moment. About 15 years ago is when I traveled to India for 4 months and became a yoga teacher. I was living in an ashram in Kerala when I was first introduced to vedic sciences, ayurveda, and began uncovering my self worth. It also was when I committed myself to being a vegetarian. I had dated a vegan a few years prior to the trip and had reluctantly eaten tofu and braggs amino acid but this trip opened my eyes to a world of spirituality that I wanted to embrace wholeheartedly. Abstaining from meat was a large part of this. From the yogic viewpoint of Ahimsa, yoga's moral code of non-harming, eating meat is not “good”. And so began my journey (or strengthened my already present desire) to do things RIGHT, to be good, and to be moral/spiritual. I was on a path to enlightenment. During that time (though I would have never admitted it aloud), I actually felt better than those who ate meat. They must not be as spiritual or self aware as me. Not as evolved. I was doing good for myself and for the planet. Or so I thought. Not that I actually saw the connection at the time but I also had taken my health to a place of being pre-diabetic, my adrenals where haywire, my cystic acne was out of control, I couldn’t sleep for the life of me, I had anxiety that would give me panic attacks, was constipated and I was constantly bloated. But I was a vegan yoga teacher. I rock climbed on the weekends. Taught 10 classes a week plus my private clients. Hiked regularly. In my mind, I was healthy. And I probably appeared to be as well. It wasn’t until I was in my nutrition class in my Master’s program from Chinese medicine that I had a massive AHA moment around my diet and my health patterns. I started to realize that many of my symptoms were actually due to blood deficiency, weak spleen function and nutritional deficiencies. But what would this mean if I started eating meat? This completely contradicted all of my beliefs. All of my judgements towards others and myself. It was only 1 year prior at a party when I ate a piece of steak because I was slightly intoxicated and my body craved it that when I got home I forced myself to throw it up out of the guilt of eating the holy cow. The belief, the guilt and moral depth of the matter ran deep. How could I start to eat meat again? But after realizing that my diet was potentially doing me harm rather than good, I did something radical. I chose me. I chose me over my dogma. I held the belief that my stomach couldn’t digest it. That I would get gas and bloating. It would make me sick. I would get constipated. And worst of all, it would make me a bad person. So I started looking for avatars. People whom I admired and were spiritual but consumed meat. I needed to know that I was not a bad person for doing this. I found out that the Dalai Lama ate meat. After becoming very ill, he had to start consuming meat medicinally. This opened my mind to the idea of conscious and medicinal meat consumption. And for almost a year, my mantra would be “the Dalai Lama eats meat” when I would have a twinge of any negative thoughts or feelings surrounding my new conscious meat consumption. In Chinese medicine, animal products are considered to be potent medicine. One should never eat meat in large quantities. It should be eaten as a condiment. Same in Ayurveda. Although, when most think about Ayurveda they most definitely think about a plant based diet. However, in Ayurveda, no food is eliminated either, all foods are welcome. Plant based is a focal point because the obvious that plants are healthy and they are said to be more sattvic; meaning it promotes calmness, peace and clarity in the mind that it tends to be the focus. In Chinese medicine this would be patterns associated with blood or yin deficiency. As I mentioned that I realized I suffered from. I started to see that all types of food could be used as medicine and that there is no one size fits all approach. That what one eats really is dependent on their state of health, the season, where they live and how they feel. I started to see eating as a spiritual act. But not in the same way that I used to. It was more about releasing the polarity and duality. It was more about listening to my body and it’s needs and less what my ego thought was right or wrong. It was allowing myself to be curious like a small child versus rigid in my beliefs. I started slowly reintroducing local sourced medicinal meat in my diet. And my symptoms slowly started to fade. Since then I have used food in so many different ways for my healing journey. I am grateful for all types of food and the energy they have provided me at different stages in my health. I saw this instagram post today where this woman was complaining about never knowing what the “right” food was any more because of all the conflicting health advice. And then I realized that the polarity still heavily exists within the health industry. We are constantly making each other right or wrong. Putting ourselves in boxes. Keto, plant based, paleo, raw foodist, AIP. Putting other in boxes. Separating and sorting. Manically trying to feel a sense of control in what can sometimes feel like a scary chaotic world. Making ourselves feel better by doing the RIGHT thing, in a world where everyone else is so wrong. But here’s the thing. A diet can’t save you. Nor can it save the planet. So yes, eating healthy can definitely move you away from disease just as easily as it can move you towards it. But that alone won’t be enough. The rigidity, thought patterns, beliefs, low self worth, lack of self love are at the core of what needs to be brought to light as well. And yes, eating more plants helps the planet but many times more packaging, synthetic vitamins, and foods shipped long distances are what supplement a diet lacking in animal proteins in the northern hemisphere. Which only perpetuates the petroleum abuse, the number one environmental polluter. And as for the moral code of doing no harm? It’s important to ask yourself, as I did, if you are causing harm to yourself by putting others first. And if the answer is yes, then ask yourself why you believe that you don’t deserve to thrive? You must really be able to be your own mother in this situation. Any mother would give her child any medicine if it meant the child being healthy and thriving. Part of our spiritual evolution is being able to be that mother for ourselves. Now, I am not saying that meat medicine is always needed. This is not some plea to get everyone to start eating meat. There are many that can thrive on a purely plant based diet. But there are also many circumstances and constitutions that need the extra support. The following are some signs and symptoms as well as some circumstances that may be inclined to need some meat medicine. Living at high elevation. It is more difficult to make blood at high elevation. After surgery or childbirth. Any time after you have loss a lot of blood. Breastfeeding. This depletes jing and blood. Chronic illness and states of deficiency. It’s important to know that you can always use meat medicine to heal and then go back to a plant based diet once you feel better. The more flexible and intuitive you are with your diet, the better results you will have in using food as medicine. I currently feel no need to put myself into a box that justifies my dietary choices. I consciously consume animal products based on the seasons and my health. In the fall and winter, when it is colder I increase my meat consumption. In the spring and summer, I decrease it. When I am at high elevation, I eat meat vs. currently in Bali (at sea level) I am eating very little. If I started feeling blood deficiency signs arise, I would increase it as well. Diet is meant to be fluid and ever changing. Just like all aspects of the natural world. And to those women in that womb circle at Spirit Fest, I would respond, Let’s not wish the world to be vegan but rather wish every person to radically love themselves, listen to their deepest needs, see their truths, and make conscious choices. That would radically transform our world. An introduction to how emotions impact health. I feel that increasingly there is more clinical research out there proving the impact of emotions on our health. Chinese medicine has known for centuries the connection between psycho emotional wellbeing and physiological symptoms. In this article, I am going to break down for you the basics of how emotions affect your health through the lens of Chinese medicine. Some of it may seem very simplistic, but what I have found through working with hundreds of clients is that actually some of the most simple principles have the most profound impact. Chinese medicine is based on the Taoist 5 elements. The five elements are Water, Wood, Fire, Earth and Metal. Each of the elements has an associated organ system, emotion, food, time of day etc. Basically everything in life can be categorized into these elements. The five yin organs of the body (kidneys, liver, heart, spleen and lungs) produce five kinds of essential Qi (circulating life force), which bring forth fear, anger, joy, worry and grief. Each of the organs is connected to one of the emotions. Anger, as described by TCM, covers the full range of associated emotions including resentment, irritability, and frustration. An excess of rich blood makes one prone to anger. Anger will thus affect the liver, resulting in stagnation of liver qi (vital energy). This can lead to liver energy rising to the head, resulting in headaches, dizziness, and other symptoms. In the long run it can result in high blood pressure and can cause problems with the stomach and the spleen. It is commonly observed that ruddy, "full-blooded" people with flushed faces are more prone than others to sudden fits of rage at the slightest provocation. "When one is excessively joyful, the spirit scatters and can no longer be stored," states the Lingshu (The Vital Axis). However, in TCM, joy refers to a states of agitation or overexcitement, rather than the more passive notion of deep contentment. The organ most affected is the heart. Over-stimulation can lead to problems of heart fire connected with such symptoms as feelings of agitation, insomnia and palpitations. The emotions are considered to the major internal cause of disease in Chinese medicine. Emotional activity is seen as a normal, internal, physiological response to stimuli from the external environment. When emotions are within normal limits, are not prolonged or repressed, they cause no disease or weakness in the body. However, when emotions become so powerful that they are uncontrollable, overwhelm or non accessible to a person, then they cause serious injury to the internal organs and open the door to disease. Western science may say that this is psychosomatic. But in Chinese medicine we believe this is a real cause of damage because we know that we are not made of just our physical bodies but are also energetic beings. Excess emotional activity causes severe yin yang energy imbalances which negatively affects the flow of blood, qi (vital energy), blocks the free flow through the body and damages the organ functions. So when you are looking at healing a chronic health condition, it is imperative that you not only support the affected organ systems but you start to uncover the emotional behaviors that are at the root of the imbalance. An example of this would be if you know you are suffering from health issues related to your liver, then exploring the emotion of anger is important. Some symptoms that may be related to liver function could be: hormonal imbalance, skin issues, jaundice, liver disease etc. Once you have identified your organ system, you can start to inquire your relationship to the related emotion. For instance, if you have an issue with liver function what is your relationship to anger? Do you often feel frustrated and angry? Or do you feel unable to express anger? Where you taught that anger is bad emotion? Both the excess and absence of an emotion are problematic. We want a healthy balance as there is no such thing as a good or bad emotion. It has more to do with frequency and the ability to move through it. Uncovering the root emotional imbalances and false limiting beliefs that fuel our lives and current health issues, is a key part of the Inside Out Program. With the support of my team and me, my clients are able to not only identify where they are stuck, how it’s affecting their health but also learn how to change it. I feel that this is a crucial missing piece in many functional medicine health programs. It’s all too easy to heal the gut and balance the hormones, but if we don’t address the emotions that fueled your choices that got you there in the first place then true healing will not occur. 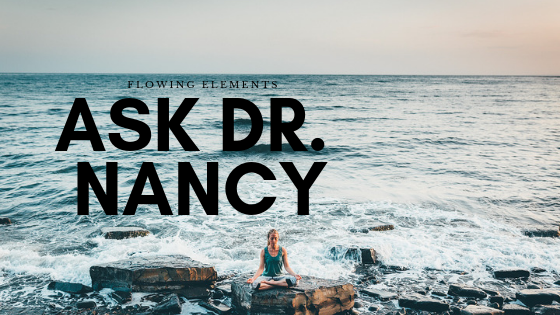 If you need help implementing the tips and want additional support, learn about my program, Inside Out or set up a complimentary 15-minute session email nancycrowell@flowingelements.com We’ll learn what getting healthy means to you and what your top goals are. We’ll also get to know each other to see if we’re a good fit! The author (“Author”) is a holistic health coach who has been trained to specialize in health, wellness, and lifestyle coaching. She provides a non-medical, complementary approach to the medical healthcare system. The Author is not acting as a physician, dietician, nutritionist, mental health therapist or other licensed or registered professional. All information in the guides or otherwise provided by the Author are for general health and educational purposes only and have not been evaluated by any government agency. Such Information does not replace professional medical advice, recommendations, diagnosis or treatment. It is your responsibility to keep your doctor informed and get medical clearance from your doctor before beginning or modifying any diet, supplements, exercise, or lifestyle program. Ask Dr. Nancy: What should I do about my anxiety? Ask Dr. Nancy: What should I do about high cortisol?